Untitled was prototyped for Ludum Dare #21, in just 48 hour Untitled was taken from a vague idea, into a game. 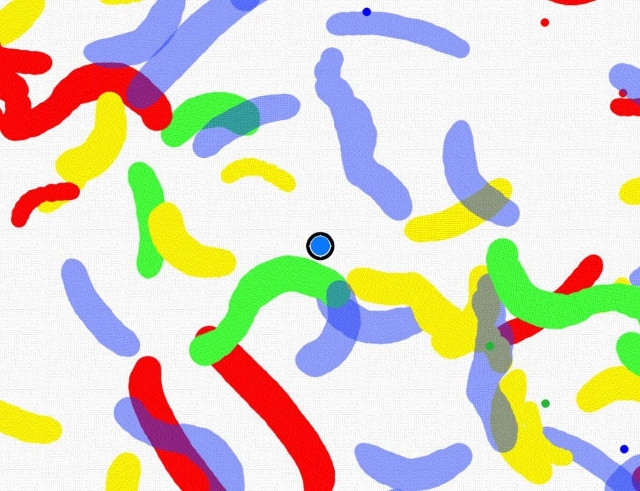 But even before Ludum Dare #21 I had been wanting to create a game based on Abstract Art...an Art Game. It needed to have all of the features of a game, meaning it needed to have a goal, with multiple ways to reach that goal. I struggled trying to come up with an idea for quite some time, I considered a point and click game. Then at Ludum Dare it all came to me. The Ludum Dare #21 had the basic premise of what Untitled was. You switched colors, and gained score form pickups. There were only four colors (Red, Green, Blue, Yellow) and the controls were a lot different. Instead of clicking the color you want to change to, you had to push 1-4 to change color. On September 5th 2011 I released Beta 1 for Untitled. This version featured new mouse based controls, translation support, and a configuration file. The configuration file allowed you to set how many object generated, but there was no individual color controls. On October 10th 2011 Untitled Beta 2 was released. Beta 2 had the level generation options displayed on the first screen, with finer controls. This was the first version that had Abilities and Traits for each color, as well as the first color that had Orange and Violet. Particles were added for when you pickup an object, but they don't reflect the color of the pickup. On January 19th 2012 Beta 3 was released. Beta 3 was the launch of this website, and the Online Leaderboards. The particle effect for pickups now reflects the color of the pickup, the main menu was also redesign. On February 19th 2012 Beta 4 was released, with many improvements and polish added. The Main Menu was redesigned again to achieve the look I wanted, violet and orange pickups were added to the game. A Leaderboard on the Main Menu was added that allowed you to look at all of the leaderboard entries. On March 19th 2012 Version 1.0 of the game was released. There were no changes from Beta 4 to Version 1. I'm happy with the way the game has turned out, and shaped up.